Ho-hum… the Browser Choice Screen failed to push usage of Opera, and its market share has been languishing for years now. 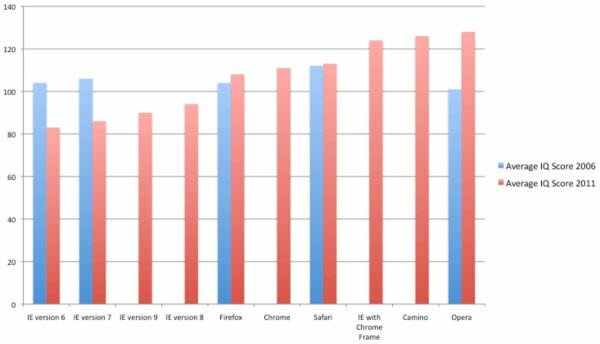 And suddenly here is this study, which indirectly says … Opera users are the smartest; Chrome, Firefox users dumb and IE users the dumbest! UPDATE: The study was bogus. A Canadian company has conducted a ‘study’ by conducting an online campaign. The company offered a free IQ assessment test on its website, to visitors of a few countries viz. USA, Canada, UK, Australia and New Zealand. The average scores of th users were calculated and co-related with their browsers. There was a clear indication from the date that the subjects using any version of Internet Explorer ranked significantly lower on an average than others. No significant difference in the IQ scores of subjects using Chrome, Firefox and Safari was noticed. Individuals using Opera, Camino and IE with Chrome Frame scored a little higher on an average than others, implying that individuals with a higher IQ score use them. It is common knowledge, that Internet Explorer Versions to 6.0 to 8.0 are highly incompatible with modern web standards. In order to make websites work properly on these browsers, web developers have to spend a lot of unnecessary effort. This results in an extra financial strain on web projects, and has over the last decade cost millions of man-hours to IT companies. Now that we have a statistical pattern on the continuous usage of incompatible browsers, better steps can be taken to eradicate this nuisance. A great link-bait study, if I may say so. Not only is this being widely discussed all over the net now, the company claims that the company is now being threatened with a lawsuit by a group of Internet Explorer users. Read the study by AptiQuant and have a great time! Any guesses on who could have financed this study!? Problem with Opera and those blue noses who developed it, they believe they are the HTML police or the world wide web. Many sites won’t display on Opera and you need the InIE button to view these because of the snobs at Opera. The title of the post must be changed to IE8 and not just IE. Bcoz IE9 is not included in the IQ test! Pls change so that people can understand the IE9’s effective things.